I made these Mini Rocky Road Cookies before we left on vacation and I wish I had a big plate of them right now to help me ease my way back into my daily routine. Chocolate always makes things easier:) The cookies are mini, but mighty in flavor. 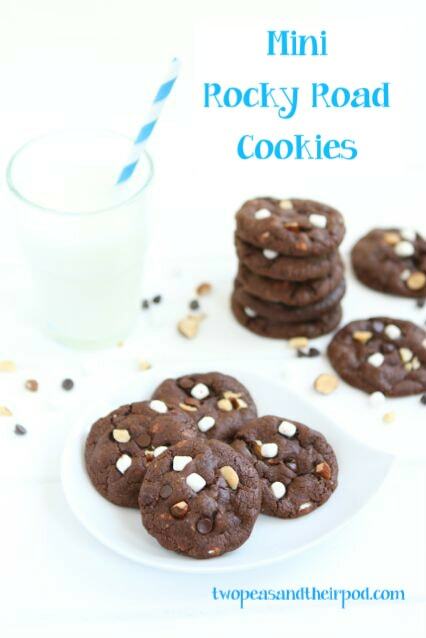 If you are a Rocky Road ice cream fan, you will love these cookies! 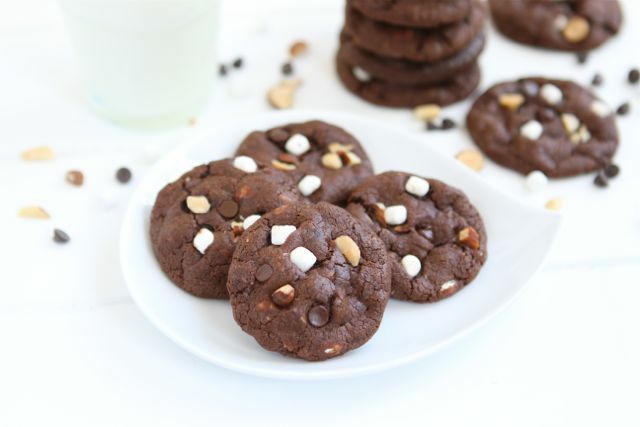 The chocolate cookies are loaded with Mallow Bits, almonds, and chocolate chips. I fell in love with the Mallow Bits after making my Mini S’mores Cookies. They are so fun to bake with. If you haven’t tried them yet, make sure you grab some at the store to make these cookies! I found them at Target by the regular marshmallows, but you can also order them on Amazon. 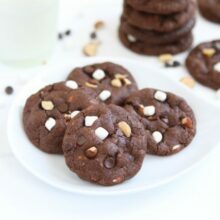 Cute little chocolate cookies packed with almonds, marshmallows, and chocolate chips. 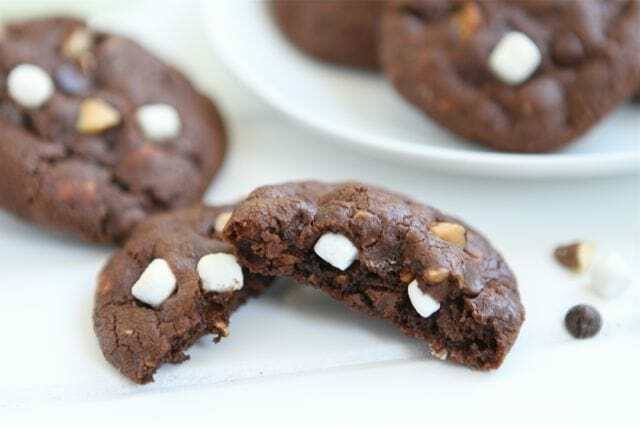 Rocky Road fans will love these cookies! 4. Slowly add flour mixture to sugar mixture and mix until flour disappears. Stir in chocolate chips, Mallow Bits, and chopped almonds. Drop cookie dough by rounded teaspoons onto prepared baking sheet, about 1 inch apart. 5. Bake cookies for 8 minutes, or until the cookies are set around the edges, but still soft in the center. Don't over bake. Remove from oven and let sit on baking sheet for 2 minutes. Move to a cooling rack and cool completely. These mini cookies are so adorable, love those tiny marshmallows! How fun! I love anything mini! could you make these with peanuts instead of almonds? Yes, you can use peanuts! Enjoy! Aw, these look so cute! Mini things always look cute 😉 Hope your vacation was good! I will be thinking about these ALL MORNING. So glad you guys enjoyed your trip!! As always, these cookies look amazing. And, I so want to bake cookies all day long. Especially now. I remember these sweet little cookies. So good! Do you ship these across the country? Cause I’d like a batch stat. I’m so glad you guys had a great time on your trip! These look the kind of cookies, I’d be happy to come home to. 😉 I love that they are so cute and mini! oh this looks like the first thing I am going to make when I finally get my hands on those mini mallows! Are these the same ones you brought to the shower? So good!!! Yes, these are the cookies:) Glad you liked them! I love rocky road! And it reminds me of Goonies too! Sloth love Chunk. Classic. These are so cute! I love rocky road ice cream, but I think I’d rather have the rocky road cookies! loving these! Happy Mother’s Day! 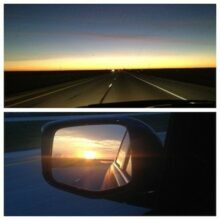 The first few days after vacation are always the toughest aren’t they? These cookies would definitely help to settle back into the routine though. Mmmm, yummy. Rah-key Rooooad? I love The Goonies! And the cookies sound like a great snack to eat while watching it. One of my favorite things on the planet is chocolate with more chocolate. And then you throw in nuts and mallows, and that’s even better! Your rocky road cookies look great! Hope you had a great weekend! These are the same ones you brought to Annalise’s shower, right? They were sooooo good! I didn’t even share with Pete and the boys. Welcome back!! I hope you had a great Mother’s Day, Maria!! Yum!!! I love Rocky Road Ice Cream, as a kid it used to be my favorite, until I discovered mint chocolate chip! These cookies look amazing and dam I could go for a few!! I can say from first-hand experience that these cookies are completely addictive. Thank goodness they’re little or I’d have to loosen up my belt in no time. I just found those mini marshmallow bits a few weeks ago at Target. These cookies look like a terrific way to use them. Love Goonies! Maria-I’m a HUGE rocky road fan, so of course now I want a plateful of these! Oh, these look amazing too! Everything you make looks so drool-worthy! These look so fun, Maria! What a great idea for a cookie and a funny movie reference! These look amazing.. Love Rocky Road! LOVE your teeny tiny cookies today! Mini cookies are the best! And dangerous.. You can eat a ton and not even realize it! Maria, these cookies are too cute!! 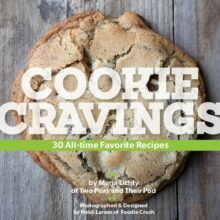 I could spend hours sifting through all of your cookie creations… i think you’ve convinced me to buy your book. 🙂 Rocky Road is one of my favorite ice cream flavors, too. Great recipe! rocky road is one of the best combos ever, and I am so glad there’s a cookie version now! omgosh, these are the cutest little cookies! you`re a genius, maria! I’ve been hoping you would post a cookie recipe! It’s been awhile. These look fantastic! i love mini anything! these look amazing! I am such a lover of all things mini- especially cookies, so these are right up my alley! Oh my goodness — this is a FANTASTIC idea!! My family is going to LOVE them!! The best thing about mini cookies is…you can eat twelve of them and not feel guilty! WIN. These look pretty addictive to me! I agree! Chocolate always makes things easier. These cookies look spectacular. Mmm! I love those little marshmallow bits and the cookies sound superb! Bookmarked! Those look so yummy! oh I just LOVE those mini cookies! These look so stinkin’ good! I haven’t seen those mallow bits at the store yet, I need to hunt them down! Be still my heart! 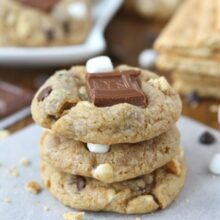 I love all things rocky road and these cookies look amazing! These look so delicious! 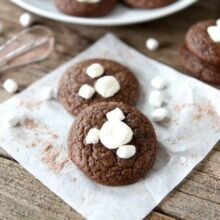 I often feel that a whole rocky road muffin/cookie is a little too intense, but I love the idea of making them mini-sized! I am dying for one of these cookies right now! reminds me i need to make more cookie recipes. Baked these tonight–very tasty! One note, for those planning on making these–it’s a very stiff dough. My KitchenAid stand mixer groaned through the last steps of mixing, and I’m pretty sure a handheld would’ve given up the ghost. I also had to baked mine longer–about 12 minutes, rather than 8, but I was doing two pans and rotating shelves, so that might be the reason. Love your site for great recipes like this one! Ha! The truffle shuffle needs to be a cookie, lol! These look to be right up my alley! Made these today for a Memorial Day cook-out. They were wonderful and definitely a mover. I did bake them for 10 minutes, though as I used a small scoop that might be a bit larger than a rounded teaspoon. What a great travel snack! Yum! Love the play on ingredients! I just wanted to tell you that today is the second time our family is making these! Have you ever tried baking these in maxi size? I don’t see any reason why it wouldn’t work but I was just wondering. They look so good I can’t wait to try em! I tried making these with just regular mini marshmallows, but they melted onto the pan and created a huge mess. Would Mallow Bits work better? do you bake these right away? I have regular mini-marshmallows in my pantry. Could I chop them up and use for this recipe? I’m thinking so.